A low energy GU10 LED lamp which is a direct replacement for GU10 lamps and benefits from longer life and cost savings. 15 Light Emitting Diodes arranged in a GU10 lamp enables fitting in any GU10 light fitting, power consumption for highly efficient operation and very low operating costs. Lamp life approximately 5,000 hours, please note these cannot be dimmed. 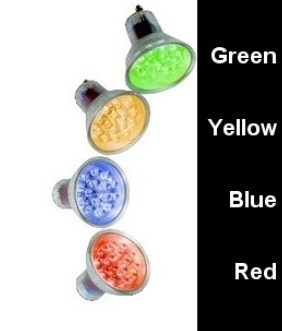 Available with green, blue, yellow or red LEDs.